Not a bad looking pair of Hi Tops for the money. Currently available in UK sizes 9 & 10. 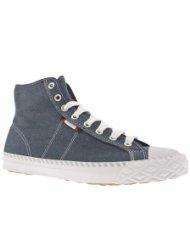 They look well made, and are not a bad alternative to Converse! Postage is £2.99 on orders under £14.99, but I image it probably wouldn't be too hard to push the order total up to this amount for Free Delivery! Free Delivery is also available if you order it to be collected from your local store! P.S. Don't forget Topcashback at 5.05%! brill - just ordered a pair!